Cholinergic agonists act at the same site as the neurotransmitter acetylcholine (ACh) and increase the activity of the ACh receptor sites throughout the body. These receptor sites are found throughout the body so their stimulation produces similar effects when parasympathetic nervous system is activated. Thus, they are also called as parasympathomimetics. Cholinergic agonists can either be direct- or indirect-acting cholinergic agonists. Under indirectly-acting cholinergic agonists, there are agents for Alzheimer’s and Myasthenia Gravis. 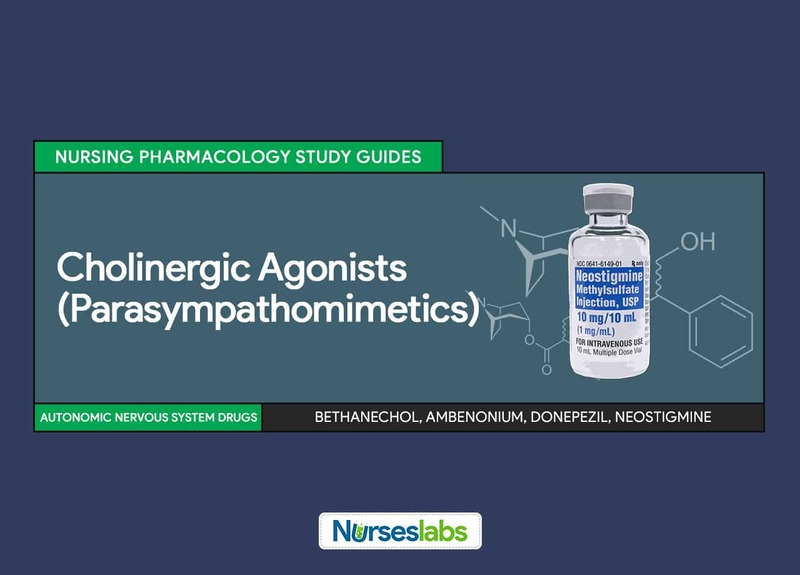 Direct-acting cholinergic agonists are usually used for treatment of neurogenic bladder atony in children, relieve pressure on glaucoma patients, and treatment of symptoms of dry mouth in patients with Sjogren’s syndrome. Indirect-acting cholinergic agents are used for myasthenia gravis and Alzheimer’s disease. Myasthenia gravis is a chronic muscular disease caused by defect in neuromuscular transmission. It is thought to be an autoimmune disease in which antibodies to own ACh receptors are made. As fewer receptor sites become available, patients begin to have progressive weakness and lack of muscle control. On the other hand, Alzheimer’s disease is a progressive disorder of neural degeneration leading to marked loss of memory and the ability to carry on activities of daily living. Direct-acting cholinergic agonists are similar to Ach and react directly with receptor sites to cause the same reaction if Ach has stimulated the receptor sites. Common examples include bethanechol and pilocarpine. Direct-acting cholinergic agonists occupy receptor sites for ACh on the membranes of the effector cells causing increased stimulation. Effects include slowed heart rate and decreased myocardial contractility, vasodilation, bronchoconstriction and increased bronchial mucus secretion, increased GI activity and secretions, increased bladder tone, relaxation of GI and bladder sphincters, and pupil constriction. Direct-acting cholinergic agonists are systematically used as agents to increase bladder tone, urinary excretion, and GI secretions. As ophthalmic agents, they can induce miosis to relieve increased intraocular pressure in patients with glaucoma. Bethanechol has specific affinity for the cholinergic receptors in the urinary bladder and is used to treat non-obstructive postoperative and postpartum urinary retention to treat neurogenic bladder atony. It directly increases detrusor muscle tone and relaxes the sphincters to improve bladder emptying. Carbachol is an ophthalmic agent used to induce miosis or pupil constriction. It can relieve the increased intraocular pressure of glaucoma. Cevimeline and pilocarpine bind to muscarinic receptors throughout the body and are used to increase secretions in the mouth and GI tract and relieve symptoms of dry mouth. They are approved for use in adults and are given three times a day, often with meals. They are at greater risk for complications related to use of these drugs, i.e. GI upset, diarrhea, increased salivation (leading to choking), and loss of bowel and bladder control. Bethanechol is approved for treatment of neurogenic bladder in children older than 8 years of age. Neostigmine and pyridostigmine are used in the control of myasthenia gravis and for reversal of neuromuscular junction blocker effects in children. Edrophonium is used for diagnosis of myasthenia gravis only. Adults should be cautioned of these drugs’ adverse effects (e.g. dizziness, GI upset, urinary urgency). They should not be allowed to operate machines. Use of these drugs among pregnant and lactating women is only justified if benefits outweigh the risks. Dose adjustment is needed as this age group is also more susceptible to drug side effects. They are more likely to have toxic levels of the drug because of renal or hepatic impairments. Bradycardia, hypotension, vasomotor instability, and coronary artery disease. Can be made worse by the cardiac- and cardiovascular-suppressing effects of the parasympathetic system. Peptic ulcer, intestinal obstruction, or recent GI surgery. Can be negatively affected by the GI-stimulating effects of the parasympathetic nervous system. Bladder obstruction. Aggravated by the stimulatory effects on the bladder. Epilepsy and parkinsonism. Affected by the stimulation of ACh receptors in the brain. Hepatic or renal dysfunction. Drugs used to treat Alzheimer’s are metabolized in the liver. Pregnancy and lactation. Potential adverse effects on the fetus or neonate. WARNING Pilocarpine and cevimeline may cause swallowing difficulties. Acetylcholinesterase inhibitors. Increased risk of cholinergic effects. Indirect-acting cholinergic agonists do not react directly with ACh receptor sites; instead, they react chemically with acetylcholinesterase (enzyme breaking down acetylcholine) in the synaptic cleft to prevent it from breaking down ACh. These drugs can irreversibly or reversibly bind to acetylcholinesterase. The ones that bind irreversibly are not used therapeutically; they are being developed as nerve gas to be used as weapons. The antidote is pralidoxime. The reversible indirect-acting cholinergic agonists fall into two main categories: agents used to treat myasthenia gravis; and agents used to treat Alzheimer’s disease. Indirect-acting cholinergic agonists react with the enzyme acetylcholinesterase to increase the stimulation of the ACh receptor sites. Consequently, ACh remains the area and accumulates, stimulating ACh receptors for a longer period of time than normally expected. Agents for myasthenia gravis increase the levels of ACh, facilitating transmission at the neuromuscular junction. Agents for Alzheimer’s disease cause elevated ACh levels in the cortex, which slows the neuronal degradation of Alzheimer’s disease. Theophylline. Increased levels if combined with tacrine. Assess for contraindications or cautions (e.g. history of allergy to drug, GI obstruction, pregnancy or lactation status, etc.) to avoid adverse effects. Establish baseline physical assessment to monitor for any potential adverse effects. Assess orientation, affect, reflexes to monitor CNS drug effects. Assess vital signs, especially pulse and blood pressure to monitor for possible excess stimulation of the cardiac system. Assess abdomen, auscultating for bowel sounds and palpating for distention. Monitor intake and output, noting any complaints of urinary urgency to monitor for drug effects on the urinary system. Administer oral drug on empty stomach to decrease nausea and vomiting. If drug is given intravenously, administer slowly to avoid severe cholinergic effects. Monitor patient response closely (e.g., blood pressure, ECG, urine output) to arrange to adjust dose accordingly to ensure the most benefit. Maintain a cholinergic-blocking drug on standby such as atropine to use as an antidote for excessive doses of cholinergic drugs. Discontinue drug if excessive salivation, diarrhea, emesis, or frequent urination becomes a problem to decrease the risk of severe adverse reactions. Provide safety precautions if the patient reports poor visual acuity in dim light to prevent injury. Provide comfort measures (e.g., quiet room, support and relaxation measures) to help patient cope with drug effects. Provide patient education about drug effects and warning signs to report to enhance knowledge about drug therapy and promote compliance. Monitor patient response to therapy (improvement in condition being treated). Monitor for adverse effects (e.g. GI upset, CNS changes, CV changes). These drugs exert their effect by mobilizing the acetylcholine into their receptors found throughout the body. Some of their effects include vasodilation, bronchoconstriction, and bladder relaxation. Ophthalmic agents can induce miosis or pupil constriction. Edrophonium is used for diagnosis of myasthenia gravis only. Cholinergic agonists act at the same site as the neurotransmitter acetylcholine (ACh) and increase the activity of the ACh receptor sites throughout the body. They do not mobilize acetylcholine into their receptors. It is an agent for myasthenia gravis and is therefore an indirect-acting cholinergic agonist. This drug is usually indicated for postoperative and postpartum urinary retention as well as bladder atony. This drug has specific affinity for receptors in the urinary bladder. Which of the following is an indication for withholding indirect-acting cholinergic agonists? A patient on neostigmine complained of frequent diarrhea and salivation. Which is the best nursing action for this situation? Educate client about drug therapy to alleviate anxiety as these are expected drug effects. Withhold the dose of the drug and refer to physician. Arrange for increasing the dose of the drug as it is not effective. Document patient response and endorse accordingly for bedside care. Discontinue drug if excessive salivation, diarrhea, emesis, or frequent urination becomes a problem to decrease the risk of severe adverse reactions. The nurse should refer this to the physician. A. These drugs exert their effect by mobilizing the acetylcholine into their receptors found throughout the body. B. Some of their effects include vasodilation, bronchoconstriction, and bladder relaxation. C. Ophthalmic agents can induce miosis or pupil constriction. D. Edrophonium is used for diagnosis of myasthenia gravis only. 1. Answer: A. These drugs exert their effect by mobilizing the acetylcholine into their receptors found throughout the body. 3. This drug is usually indicated for postoperative and postpartum urinary retention as well as bladder atony. 4. Which of the following is an indication for withholding indirect-acting cholinergic agonists? 5. A patient on neostigmine complained of frequent diarrhea and salivation. Which is the best nursing action for this situation? A. Educate client about drug therapy to alleviate anxiety as these are expected drug effects. B. Withhold the dose of the drug and refer to physician. C. Arrange for increasing the dose of the drug as it is not effective. D. Document patient response and endorse accordingly for bedside care. 5. Answer: B. Withhold the dose of the drug and refer to physician.